Many communities of color experience profiling, a discriminatory law enforcement practice that targets individuals as suspicious based on race, ethnicity, religion, or national origin. Additionally, this sanctioned form of discrimination fosters stereotypes and threatens community safety as targeted groups are wary to engage with law enforcement. Despite the fact that profiling does not work, diverts limited law enforcement resources, and undermines community relationships, it is still widely used by the government under the guise of national security. Since September 11th, Arabs, Muslims, Sikhs, and South Asians have increasingly faced government scrutiny based on their race, national origin, and religion in various arenas. This problem often takes shape in the form of being singled out for extensive searches when boarding a plane, experiencing FBI background check delays with immigration applications, and the surveillance of Muslim communities. South Asians have also faced profiling through immigration policies that have focused on nationals from certain countries. For example, certain male nationals from predominantly Muslim and Arab countries, including Bangladesh and Pakistan, were required to register with the Department of Justice through a program known as “special registration” in the wake of 9/11. As a result of this initiative, nearly 14,000 men were placed in detention and deportation proceedings, primarily for minor immigration violations. SAALT works to increase awareness within the community and the government about the discriminatory and ineffective nature of profiling. 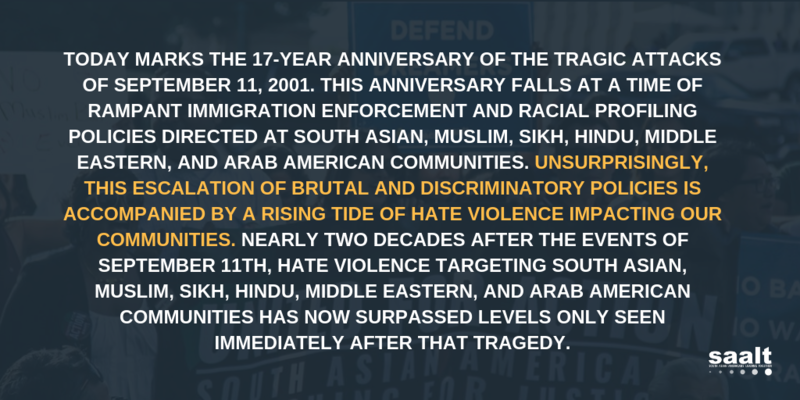 Along with South Asian community-based organizations, and Arab-American and Muslim-American ally organizations, SAALT has called upon members of Congress, law enforcement agencies, and prosecutors to end policies and practices that have the intent or impact of profiling.